Bake sale! Don’t those words just conjure all good things? The smell of fresh baked treats, hanging out with friends at the sale table, raising money for a good cause… add to that the fact that I was asked to make some crafty signs to advertise our bake sale, and I am in heaven! For the past four years, a group of my coworkers and our friends have formed a team for the Avon Walk for Breast Cancer. I’ve always been excited by this event, but I was hesitant to join – partly out of the logistical hurdles of training and walking with small kids at home – and partly out of a fear that after working with people with cancer in my job and having lost my mom to breast cancer, participating in this event might lead to emotional overload. I can’t explain why, but for some reason, this seemed like the year that I wanted to make the Avon Walk a part of my journey. As part of our fundraising and team-building, we are holding a bake sale this year. 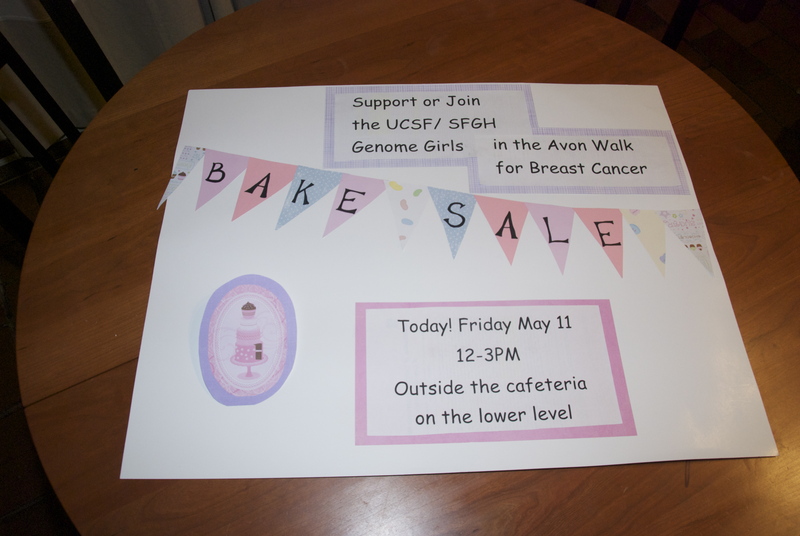 If you are in San Francisco and can come by the UCSF Cancer Center at 1600 Divisadero Street tomorrow (Friday, May 11, 2012) from 12-3, you can support our team and taste what I guarantee will be a delicious array of treats. We will be outside the cafeteria on the lower level. These were certainly not works of art, since I threw them together at the last minute, but I still had fun with the design. I had some cake-themed papers from a large pack, so those were the inspiration for the colors. Of course, the pink also tied in to the Avon and breast cancer awareness colors. I made the cakes stand out from the poster by folding a paper “spring” on the back. And the little pennants give a sweet homemade flavor, just like our desserts! I hope our homey bake sale signs with the cheerful pennants attract lots of hungry customers! The slight incongruity of selling sweets to raise money for a health-related cause has not escaped me. While I will no doubt be indulging in the brownies and truffles some of my friends have planned, I decided to offer a slightly healthier option, with the banana bread recipe my mom used when I was little. This recipe is in a notebook she gave me when I got married. 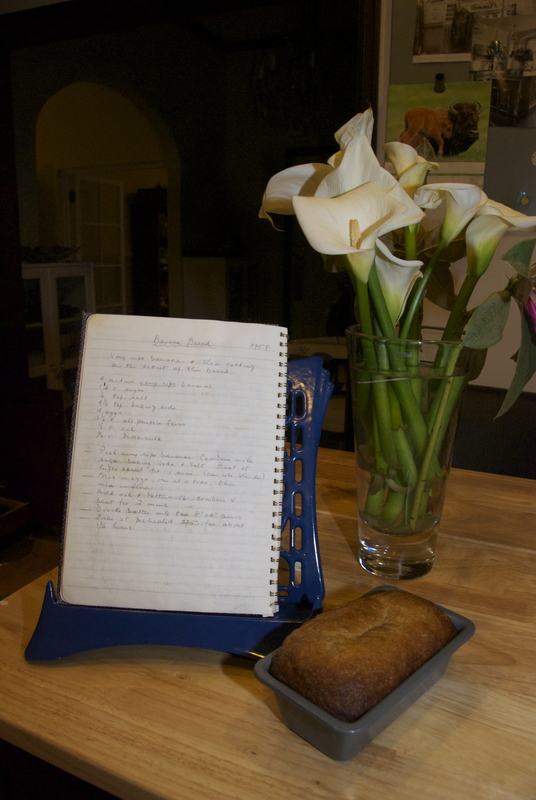 It has a lot of our “comfort” recipes from childhood and blank pages to record my own. I’m so very glad I have this book. I’m sure it’s just the description she transcribed from the magazine or recipe book, but the sentence “Very ripe bananas and slow cooping are the secret of this banana bread” makes me feel like my mom is sharing a secret just for me. I love seeing my mom’s handwriting in this recipe notebook she gave me when I got married. 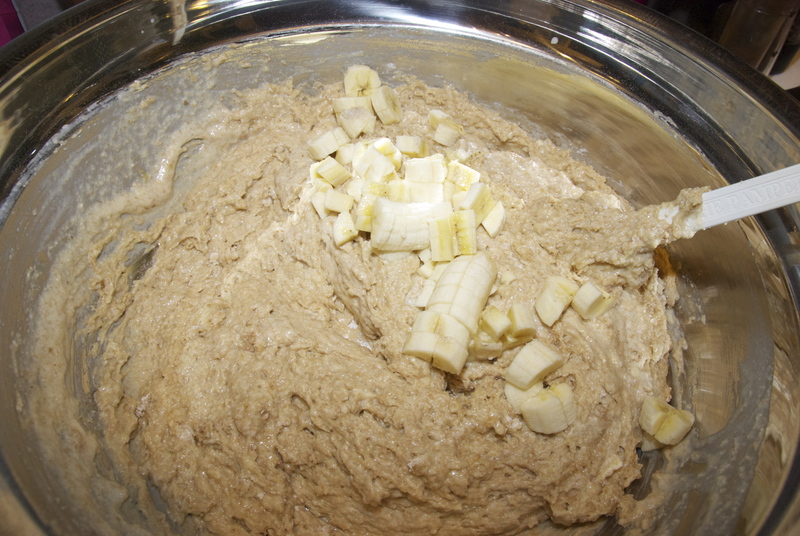 Very ripe bananas and slow cooking are the secret of this bread. It’s hard to get a lot of very ripe bananas, at least in this house, because they keep getting eaten. This recipe calls for four, so if we have one or two overripe bananas, we put them in a bag in the freezer to save up until we have enough for banana bread or hubby’s amazing banana waffles. The new thing I’m trying this time is chopping some of the bananas into chunks and folding them in at the end with the chocolate chips. I had banana bread from Tartine Bakery on Guerrero, which I think is very possibly the best bakery in the city, the other morning that had the small chunks in it, and they were caramelized and delicious! Chunks of banana mixed into the batter for a fruity flavor and sweet caramelized morsels. I love this bread with walnuts and chocolate chips, but we appear to be out of walnuts tonight, so I will have to “make do” with chocolate chips only. Hubby recently articulated that he thinks nuts ruin baked goods, while I think they make them – they’re crunchy, rich, and I love the bit of bitter taste of walnuts against the sweetness of a cookie… obviously he’s wrong, right? He did make me a batch of chocolate chip cookies with nuts for my birthday, and he presented them to me, saying, “I put nuts in these, even though I don’t believe in it.” That’s love.